Hot on the tail of their debut single ‘Seven’ late last year, Melbourne four-piece APES came to the attention of Triple J, and more recently some serious UK love from Radio BBC1. A mix of searing garage-rock and stamp-your-feet-shout-out-loud choruses are set to put APES firmly on the map both home and abroad. 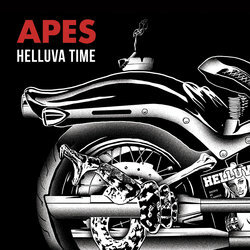 Led by vocalist and guitarist Benjamin Dowd the APES sound is one that owes as much to the indie punk bombast of the Hives as it does the moody atmospherics of Black Rebel Motorcycle Club and to the halcyon years of Australia's illustrious rock'n'roll and garage/punk past. Combining an ear for scrappy, rough and ready melodies with strong hooks (and those can't forget 'em choruses) APES stamp the sound as their own. Having played shows around the country with likes of The Datsuns, Dune Rats and Yacht Club DJs, APES high energy driven live show landed them spots on 2013's Big Day Out and Groovin The Moo Festivals. The band’s debut EP, produced by Malcolm Besley (Northeast Party House, Millions, Snakadaktal), is set for release this June 2013. Catchy, catchy, catchy, catchy, catchy, catchy, catchy, catchy, catchy, catchy X 5 and there's the 50 words we have to describe the song. In all seriousness, just a couple of listens and you'll be singing 'I just want one Helluva Time, I just need one Helluva Time'. Trust us!